At the courthouse, at the worst trial in the history of all trials, the judge tosses out any evidence relating to the wire tap. Alexis takes the stand to testify, but seems confused and under the influence. Scott accuses Paul of leading the witness and the judge calls a recess. Jordan questions Alexis, who admits she had a glass of wine to calm herself before coming. Michael sits with Sabrina and puts the ring on her finger. Tracy is shocked and offers Michael her condolences. She tells him that Sabrina saved Monica. Monica wakes up to Jason&apos;s talk and is happy to hear that she&apos;ll be getting another grandchild. Jason explains that the killer came after her in her office. Nina mistakes Nelle for her potential baby mama. She&apos;s introduced by Carly. Nelle thanks Nina for bringing her to PC. Nina decides that Nelle needs a new wardrobe to work with Carly. Nina drags her off. Tracy tells Monica that Sabrina saved her, but that she has been murdered. Dante questions Monica, who remembers a smell. She thinks she recognizes it from the mansion. Dante wants an autopsy on Sabrina, but Michael wants more time with her. Michael says his goodbyes, then Felix does. Tracy tells Monica that they need to close the hospital until the killer is caught. Monica is worried the doors will never reopen. Jordan arrives and Monica agrees to close the hospital. Michael heads to the Metro Court. Carly apologizes for her previous opinion about Sabrina. Michael tells her that Sabrina is dead. 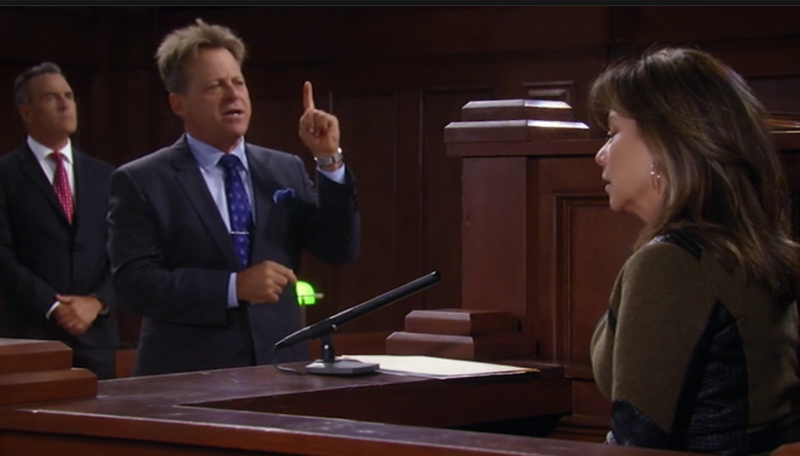 Back at the courthouse of inanity, Scott browbeats and confuses Alexis until Julian calls out to leave her alone. Scott claims Alexis is lying about Julian trying to kill her, but Sam calls out that he did. The judge admonishes everyone. Alexis leaves the stand and collapses in Julian&apos;s arms.